The magician produces a silk, which he passes through his fingers, and from the silk, he produces a bowl of fire. The performer reaches into the flames once, reaches into the flame a second time and pulls out a silk; or while holding the bowl, the flame is extinguished and a silk will pop-up, either way at the discretion of the Magician. Or at any time you can reach under your coat or from pocket produce a burning bowl of fire, maybe just as a comedy routine. 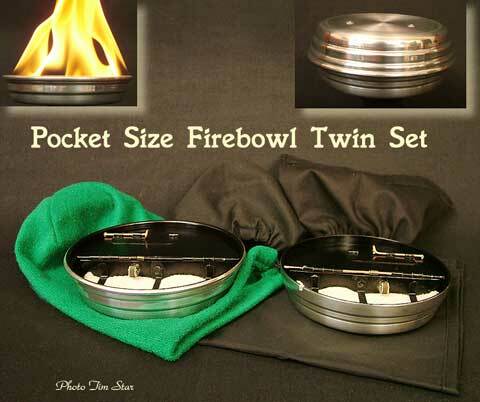 The Pocket Size Firebowls were created several years ago by Tim Star and is used by many known magicans. The size of the bowls are 11cm (4”¼) in diameter and 23mm (7/8) high. It is made of aluminum with a firing mechanism that is virtually silent with a 100% foolproof system using no electronics or chemicals. The bowls are self-extinguishing. To complete your set you will also receive a specially designed pocket and 2 different harness used for super quick one-handed release. They are needed for the productions mentioned in the instructions. Also detailed step-by-step illustrated instructions, production methods and even vanishing methods with information covering all aspects of firebowl production is included. 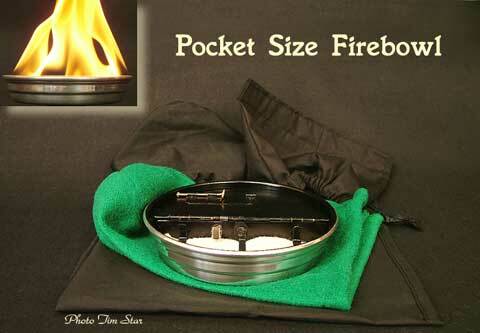 The firebowls can be produced the same way you would a dove and all harness and pockets will be supplied to do so. Silks not included. The same bowls as described above in every aspect however this twin set is 2 bowls nested together, so that from one production you get two bowls of fire, each bowl with it’s own firing mechanism and extinguishing mechanism. This Twin Set comes with two different harnesses for two different productions. Each bowl can be used independently for single productions. Whether using a single bowl or the twin set, this effect can be presented at any time during your act.